We recently went to a restaurant which had launched their new winter menu and there it was Sarson ka saag and Makki ki roti! It’s the one dish that sort of defines winter cooking, especially in Punjab. 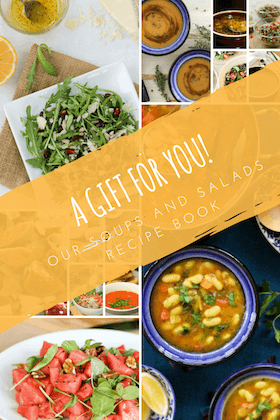 Winters in general are great for cooking… The lots and lots of fresh green vegetables that come in winters bring a smile to my face every time I go vegetable shopping. Sarson ka saag is a traditional Punjabi dish made with three types green leafy vegetables – mustard leaves, spinach leaves and bathua leaves (There is no common name for Bathua in English, the technical name is Chenopodium album, which sort of is a difficult name to use! So we stick with bathua). The healthy saag is best paired with Makkai ki roti, ghee and gur. 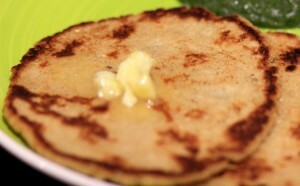 The sweetness of corn and jaggery cuts the bitterness of the mustard leaves. In the saag preparation as well, milder tasting leaves like spinach and bathua are added for the same reason. Most preparations of saag involve pressure-cooking or blanching the greens, but I feel that makes the greens lose their color! I followed Sanjeev Kapoor’s Khana Khazana recipe for both the Sarson ka saag and Makki di roti. The makki ki atta or corn flour used is flour made from Indian yellow corn. We normally buy it lose from our local flour mill. It is coarser than the cornflour used as a binding agent and also in baking. My friend in US told me that she uses the finest available cornmeal as they don’t get the India corn flour there. Separate the leaves from the stems of the green vegetables. You can keep the softer stems, but I don’t like using the thick stems in the saag. I instead use them to make vegetable stock. Wash all the leaves in running water. It is important to wash them at least 3-4 times to make sure you get all the dirt stuck on the leaves out. Roughly chop all the leaves and other veggies. Heat oil in a pan. Add ginger, garlic, green chilli and onions. Sauté for a couple of minutes, till the onions become soft. Add the chopped leaves and mix together. Add salt to taste; mix well and cook covered for 4-5 minutes till the mustard and other leaves turn soft. It’s interesting how the dish uses only salt and no other spices. You get the authentic flavors of mustard balanced with other greens and ginger-garlic and onion. Dissolve the corn flour in 1 cup water and add to the pan. Mix well and cook covered for another 5-6 minutes till the veggies are completely cooked. Remove from heat. 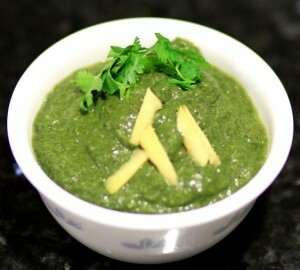 Once the saag is cooled; grind it to a coarse paste using a handheld blender. Simmer the saag on low heat for a couple of minutes before serving. Add hot water. Mix together a wooden spoon. The dough should not be very soft, so add water slowly while mixing. I used about 1 cup of hot water. It’s better to be on the lower side of water at this time, you can add more water, if required, while kneading with hand. Leave the dough covered until it is cool enough to be kneaded by hand. Knead to make a medium soft dough. Dampen your hands with a little water. Divide the dough into 8 equal parts and shape into balls. Lay a plastic sheet or a ziplock bag on your kitchen work surface. Place one ball at a time, on the sheet; and roll out, into a 5-6 inch diameter circle, using your fingers. Heat a flat non-stick pan (tava), add a little ghee on the hot pan and place the roti on it. Cook over medium heat, till one side half done. Turn over and spread some more ghee on the sides. Cook till both sides are golden brown. I actually timed and each roti takes about 5 minutes! So you can better use the time if you start makki ki roti along with the saag cooking. You can also add soft Paneer cubes to the saag for a twist! 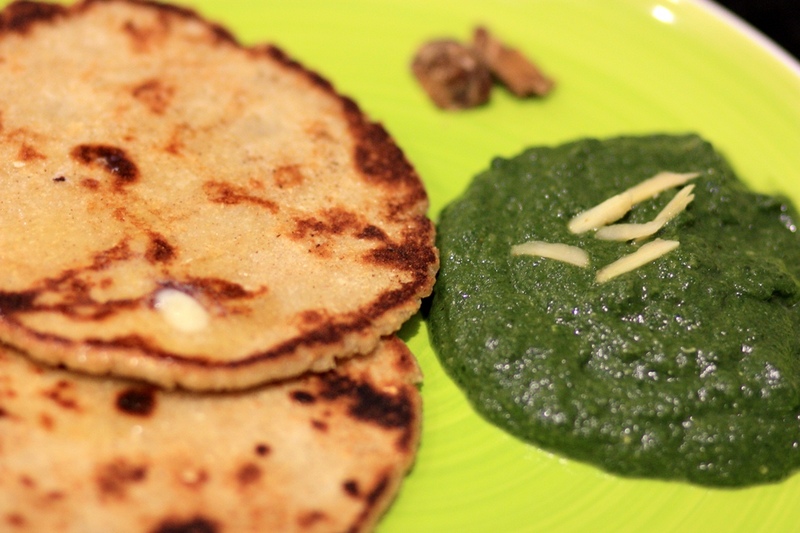 Serve hot sarson ka saag with hot makki ki roti, with a dollop of butter and gur on the side.